As I alluded to in Friday’s post, I’ve been working for a while on merging my virtual assistant and quilting businesses. I’ve been re-branding as The Creative VA and for quite some time I’ve been wanting to work with designers to assist them with their administration tasks so that they can free themselves up to spend more time designing and making fabulous quilts. After discussions with a very lovely designer I did some pattern testing and editing for, I am very excited to now put in place the first step of that process. 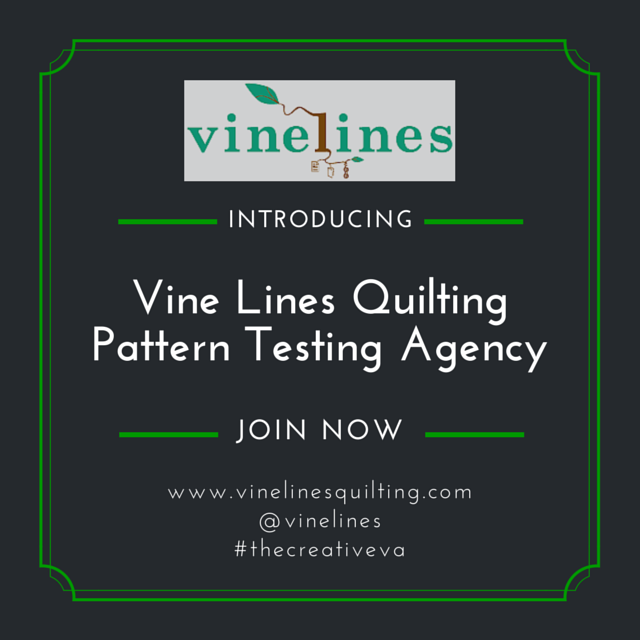 Today I’m launching the Vine Lines Quilting Pattern Testing and Design Agency. The model is simple; quilt designers need to have their patterns tested before publishing but this takes time and concentration that could be better used to make more things! There are a lot of talented pattern testers who would love to test for designers. So, this Agency will fill that gap and streamline the pattern testing process. Put simply, I will have a group of testers who designers can call upon but instead of you as a designer having to contact the testers directly, you will contact me and I will handle the entire process from then on. The benefit for designers is that the hassle of the pattern testing process will be managed for you and the benefit for testers is that once you are registered with me, you’ll have access to some fabulous designers who would love to work with you. Would you like to join me? If you’re a designer who would love to work with me and have your testing process streamlined, please email me at (linden at vinelinescreative dot com) and I will send you an information pack. You might also like to join my new Facebook group, Vine Lines Quilting Designers’ Group. if you are a pattern tester, of any ability, and you would like to register, please fill out the form below. You’ll need to be registered with me to receive pattern testing opportunities. I’ve created a Facebook group for you, here: Vine Lines Quilting Pattern Testers’ Group. This will be where opportunities are advertised as well as any discussions relating to pattern testing. Please have a read of the form below, and if this is something you’re interested in, fill the form out with your details. In time there are other services I’ll be offering to designers; I’m really excited about the plans I have and I hope you are too. I’m looking forward to seeing them! This is a very exciting thing happening! I filled out the form – though you only asked for experience level for quilting. I wonder whether you should ask for experience level for all the different types of test items. I would classify myself as intermediate for quilts and bags, but advanced for clothes sewing. Just a thought. Thanks! Hi I design quilts and sell the patterns on craftsy. I would love some one to test my patterns as I truly do no want to make every quilt quilt I design. Is there a charge? Fabulous – thank you Barbara!